Stitchy Quilt Stuff: Swoon is FINISHED!!!!! Love, love it. Mine is coming. I have more cut out than sewn but it's coming along. Madison picked out a dark grey for her background and I was skeptical but it is really pretty. Congratulations on the near finish. 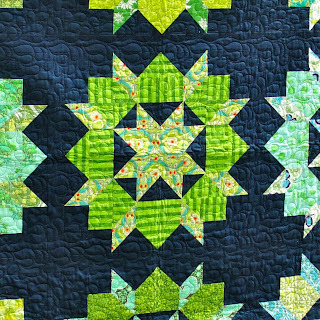 Wow this is one delicious quilt :) I adore anything green and this rocks!!!! I swoon at your swoon!!! Just beautiful! Love the navy background, and the quilting is fantastic! beautiful job!! I love the colors!! MMMMMM. Those are some good looking hands holding up that quilt. Gorgeous, gorgeous, gorgeous!! Another fab Inspiration! You And yer mum rock!! Absolutely beautiful. I love the navy and greens together and who doesn't love the swoon pattern? Mom's quilting finishes it beautifully. Your swoon is beautiful I love the colours you used and the navy background. This is possibly my favourite of the many swoon quilts I've admired on quilting blogs. The navy background is wonderful and I laughed at myself when I described your quilt (when I pinned it) as using a "medley of mixed greens"! It sounds like a delish salad! Wow! This is awesome. Wonderful fabric choices. This is great! Lovely colours!